It’s cold out. Last night we had the first frost of the year, and although I was out this morning harvesting the last of the year’s raspberries in the sunshine, there’s no hope of sitting out in the warm any more. Huddled under a blanket, looking forward to winter’s big bonus – upcoming Dr Who specials and the return of Nordic Noir dramas, we settled down to watch the West Wing box set we’re working through (why-o-why doesn’t Josh Lyman come out of retirement and run for President in 2016). 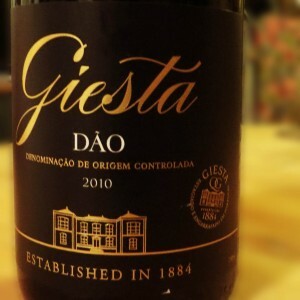 We had a Giesta Dao 2010 from Laithwaite’s wine to go with our wintry evening, the bottle looked big and heavy, substantial enough to keep us warm. The wine that came out of it looked less opaque than I’d expected, with a brighter colour. It smelled of fresh red fruits and something a little like orange blossom, but I’d just eaten some clementines in brandy with ice cream, so don’t trust me on that. It tasted fruity too, but with only a medium body at its biggest, with ripe tannins. There was a secondary flavour of spice, quite hot chili spice rather than Christmas style warm spices. I did like it, but I’d put it in the midweek warmer category rather than the weekend treat.